Which sea creature only walks sideways? Why do squid squirt ink? How does a dolphin breathe air but live in the sea? Find out when you spend a day at the amazing aquarium! This visually stunning, colour-splashed guide walks you through a typical aquarium visit, introducing some of the fascinating creatures you’ll meet there: sea horses, electric eels, boxer crabs, clownfish, dolphins and sharks. The punchy graphic layout is peppered with vibrant artwork and photography, fast facts, habitat maps and general information about how ocean animals live in the wild. 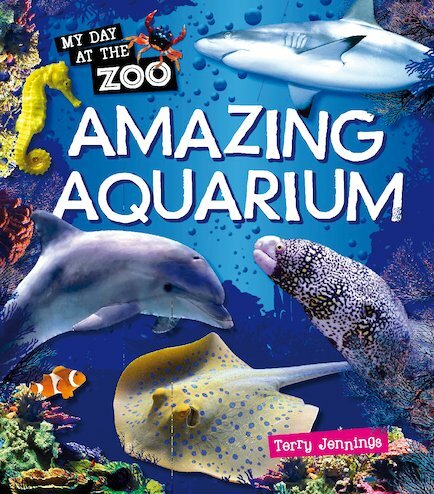 The book also includes exciting Zoo View facts explaining how scientists study and protect sea creatures across the world.